Super-muscly livestock have been produced before. But these animals, like the famous Belgian Blue cattle, are products of meticulous breeding, and not genetic engineering. Owing to health and environmental concerns, no genetically modified animal has ever been approved for human consumption anywhere in the world. But as David Cyranoski reports in Nature News, a team of scientists led by Seoul National University molecular biologist Jin-Soo Kim is hoping to finally change that. Key to creating the double-muscled pigs is a mutation in the myostatin gene (MSTN). MSTN inhibits the growth of muscle cells, keeping muscle size in check. But in some cattle, dogs and humans, MSTN is disrupted and the muscle cells proliferate, creating an abnormal bulk of muscle fibres. These results have yet to be published, but the preliminary results weren’t entirely promising. Yes, the genetically jacked-up pigs produced the desire muscle-mass, but the process resulted in birthing difficulties owing to the piglets’ abnormal size. What’s more, only 13 of the 32 pigs survived to eight months old, just two remain alive, and only one is considered healthy. 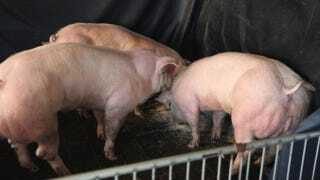 At this stage, the researchers aren’t trying to mass produce these double-muscled pigs; instead, they’re hoping to sell sperm for breeding with normal pigs. Looking to the future, Cyranoski claims that federal regulators, like the FDA in the United States, are more likely to accept this gene editing technique over other forms of genetic modification because no new genes were introduced into the pig’s genome. Technically speaking, these aren’t transgenic organisms. But while most nations of the world try to sort out the ethical, health, and safety concerns, Kim is hoping to sell the edited pig sperm to farmers in China where regulations are more lax—and where demand for pork is on the rise. Read the entire article at Nature News. Contact the author at george@io9.com and @dvorsky. Top image by Xi-jun Yin. Blue bull image by agriflanders/Flickr/cc.